North America’s most popular freshwater sport fish, the largemouth bass is a member of the sunfish family. Two subspecies of largemouth bass (LMB) are typically recognized: Florida and northern. Largemouth bass sometimes reach weights of over 20 pounds, occasionally having lifespans of 15 years or more. In most areas, largemouth bass have a modest range, typically moving less than a mile throughout the season. Largemouth begin to spawn when they weigh 1 to 3 pounds. The spawning season begins in early spring, depending on the water temperature. The species is commonly stocked in private ponds, almost always in conjunction with one or more forage species. Largemouth bass are considered a gamefish; no commercial harvests of these fish for food are allowed in the U.S. The species recognized as is the state fish of Georgia and Mississippi, official freshwater fish of Alabama and Florida, and the official sport fish of Tennessee. 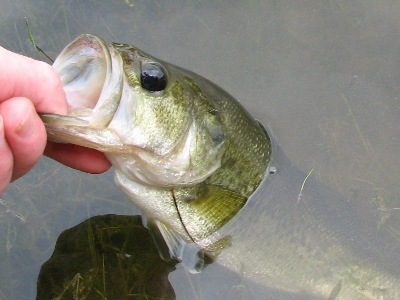 Largemouth are sometimes affected by a number of conditions such as largemouth bass virus, intersex, and melanism. Other names for the species include LMB, black bass, green bass, large mouth bass, bucket mouth, striped bass, freshwater bass and others.